Posted on July 30, 2006 by Alicia Bay Laurel	in Blog. 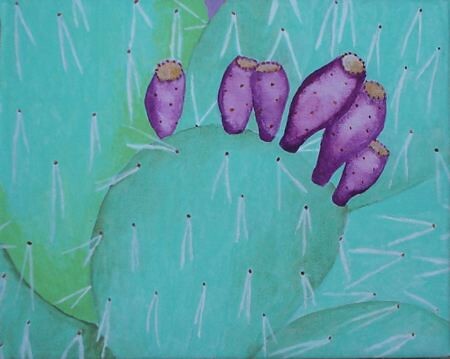 I painted this prickly pear in Phoenix last year. I forgot one more great hot weather fruit: prickly pears. Their flesh has the colors and flavors of melons, and this time of year they show up in the flashier produce departments (or at funky openair farmers markets, if you’re in their biome), all de-thorned and ready to eat. All you have to do is make an incision with a knife along one side and slip the skin off. I’ve been on a prickly pear picking expedition with my friends George Wright and Rose Momsen, on the slopes of Haleakala, Maui, back in the ‘80’s. George wore electrical gloves, heavy boots, jeans and a long sleeved shirt, and he might have had something protective on his face. Prickly pears don’t just HAVE thorns. They EJECT them. So, thus attired, did George approach the cactus with a machete and a large bucket of water. The theory is that when you cut the fruit off the cactus into a bucket, it ejects its thorns into the water instead of the air. It works. Prickly pear cactus is part of the opuntia family, and not only do its fruits taste like melon; its leaves taste like green bell pepper, and are known in Mexican cooking as nopales (noh-PAH-lez). Here’s the killer nopales recipe page, with grilled nopales, nopales omelette, nopales salad and nopales salsa. Desert Lil has a page of prickly pear recipes, too, but they’re all about cooking the fruit with sugar. Why bother, when they are divine served raw and unadorned? As if that were not enough, the nopal cactus enjoys a wide reputation as a medicinal plant.